Lavender Oil Market Segmented By Form – Absolutes, Concentrates (100% Pure Lavender Oil), Blends; Application – Therapeutics, Personal Care, Cosmetics, Aromatherapy, Food and Beverages, Others. In the Recent published report ‘Lavender Oil Market: Global Industry Analysis and Forecast, 2016–2024’, Persistence Market Research has studied the global lavender oil market for an eight year period on the basis of various important parameters such as absolute dollar opportunity, incremental dollar opportunity, CAGR and Y-o-Y growth rate. Expert analysis has been provided by Persistence Market Research on both the current trends as well as the direction the global lavender oil market is expected to take during the study period. The global lavender oil market report begins with an executive summary that includes a broad overview, the future roadmap, market dynamics and key figures such as CAGR, the market revenue for both the years 2016 as well as the year 2024 and the market value application split. The market approach to be taken in the global lavender oil market, segments to target and the differentiation strategies that could be adopted to succeed in the global lavender oil market are also provided herein. The next section of the global lavender oil market report provides a market introduction. It has the definition lucidly explaining what the global lavender oil market is, details of the parent market, as well as the market taxonomy. The next section of the global lavender oil market report is a broad analysis of the global lavender oil market. It begins with the most critical metric – pricing. A pricing analysis on the basis of certain assumptions has been given for each geographic region studied in the global lavender oil market report. The global lavender oil market size forecast in terms of U.S. dollars, the Y-o-Y growth, and absolute dollar opportunity can be gleaned from this section. The value chain analysis that highlights the relation between all the key stakeholders in the global lavender oil market such as farmers, distillers, facilitators, traders and customers is explained in an easy-to-understand attractive infographic. Statutory requirements for a few of the major regulatory bodies in North America and Europe including the FDA, AHPA, NAHA, EFEO and ECHA are also explained in the analysis section of the global lavender oil market report. To truly capture the essence of the global lavender oil market, it is essential to understand the market dynamics thoroughly. For achieving this objective, readers are advised to read the market dynamics section of the global lavender oil market report. This section includes the macro-economic factors that impact the global lavender oil market, drivers from both the supply as well as demand side and the restraints that impede the growth of the global lavender oil market. The opportunities that can be exploited follow the drivers and restraints along with the overall trends in the global lavender oil market. The relevance and the impact that these forecast factors can have has been studied in detail. A PESTLE analysis and Porter’s Five Force Model ensure that the report reader has a holistic picture of the global lavender oil market. A key section of the global lavender oil market report is the market analysis and forecast on the basis of form, application and region. Basis Point Share, Y-o-Y growth projections, absolute dollar opportunity, a few major trends and the market attractiveness are highly useful to adequately understand the global lavender oil market and all of its particular nuances. This section has also studied the global lavender oil market on the basis of important geographic regions. Every region has been profiled in terms of Basis Point Share, Y-o-Y growth projections and important regulations pertaining to that geography. The market attractiveness for the most important countries in every region, prominent trends and an impact analysis of regional drivers and restraints completes the regional analysis of the global lavender oil market report. No market is immune from competition of some kind and this also holds true for the global lavender oil market. In the competition landscape section, a market share analysis for the companies has been provided for the first year of the study (2016). 10 of the most prominent companies actively involved in the global lavender oil market have been profiled in the global lavender oil market report. The company description, geographic presence, key financials, revenue growth rate, strengths, weaknesses, opportunities and threats have been highlighted for the readers’ benefit. Some of the important developments pertaining to the company and a strategic overview are mentioned to provide the required information key stakeholders may need about the competitive landscape they can expect to face in the global lavender oil market. A number of assumptions have been made while preparing the global lavender oil market report and certain acronyms have been used. These have been explained appropriately in a separate section towards the conclusion of the global lavender oil market report. Persistence Market Research has developed a unique research methodology to prepare the global lavender oil market report. The analysts at Persistence Market Research begin by conducting exhaustive primary and secondary research to create a detailed discussion guide. A list of industry players consisting of manufacturers, distributors, retailers and industry experts is prepared. After thorough interviews with industry players and experts, the necessary data is collected. This data is then validated using the triangulation method wherein primary and secondary research is consolidated with Persistence Market Research expert analysis to deliver the final data. The final data is then scrutinized with advanced, proprietary tools to glean qualitative and quantitative insights into the global lavender oil market. The Personal Care segment had the highest market share of more than 34% in 2016 and it is poised to grow at a CAGR of 6.6% for the period 2016 to 2024 in terms of value. The Personal Care segment by application is predicted to gain 1.1 basis points in the year 2024 as compared to 2016. Personal care should gain momentum among the global population on account of strong demand for essential oils that are naturally derived. This will increase the overall scope of the global lavender oil market. A Y-o-Y growth from 5.8% to about 6% can be reasonably estimated for the Personal Care segment for every year in the forecast period. 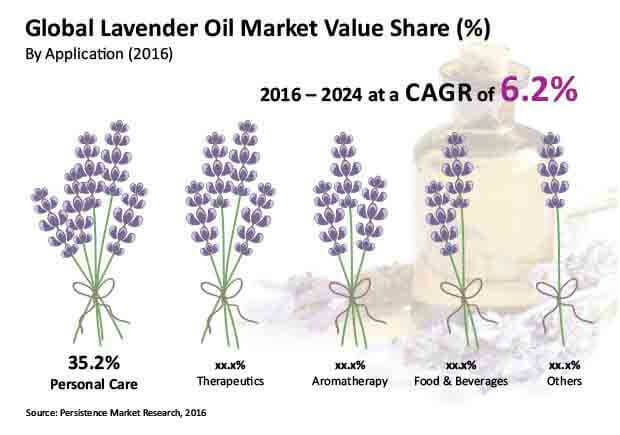 In the year 2015, the Personal Care segment of the global lavender oil market was valued at a little more than US$ 25 Mn and this should rise to just over US$ 45 Mn by the end of the study period, registering the highest CAGR among all the application segments of the global lavender oil market. The Personal Care segment is estimated to create absolute $ opportunity of US$ 18.10 Mn between 2016 and 2024. Rising demand for grooming products compounded with increasing skin diseases is forecast to boost demand in the Personal Care segment in North America, Europe and APAC. In terms of revenue, the Therapeutics segment accounted for more than 25% of the global lavender oil market in 2016, with a CAGR of 6.0% for the period 2016-2024. Therapeutics is anticipated to show substantial growth over the forecast period as demand for lavender oil products is increasing by leaps and bounds. This can largely be attributed to the beneficial effects of lavender oil particularly as an antibacterial and anti-fungal solution to effectively counter sunburns, insomnia, wounds and other ailments. In the global lavender oil market, the Therapeutics application segment had a value of slightly under US$ 20 Mn in 2015. This is poised to rise to more than US$ 30 Mn by the end of the year 2024, making Therapeutics the second largest segment in terms of application in the global lavender oil market. The Therapeutics segment is estimated to create absolute $ opportunity of US$ 11.9 Mn between 2016 and 2024. Europe is the geographic hub of the global lavender oil market with Bulgaria being the largest producer. Nearly 3/5th of the total production of the global lavender oil market can be traced to Europe. The market value of the Personal Care segment in the Europe lavender oil market was just under US$ 12 Mn in 2016 and this should rise to nearly US$ 20 Mn by the end of the year 2024, witnessing a CAGR of 6.5%. The Therapeutics segment accounted for a market value of US$ 7.5 Mn in Europe in the year 2016 and this is predicted to grow to almost US$ 12 Mn by the year 2024, registering a CAGR of 5.7%. However, the application segment to watch out for in the Europe lavender oil market would be Aromatherapy as it is forecast to record the highest CAGR of 6.6% for the period 2016-2024. The vast majority of the European populace is health conscious and aware of the benefits obtained from naturally derived lavender oil and there is a marked increase in consumer spending on healthcare products. That is why it is safe to assume that Europe will continue to account for a large share of the global lavender oil market. International Flavours & Fragrances Inc.